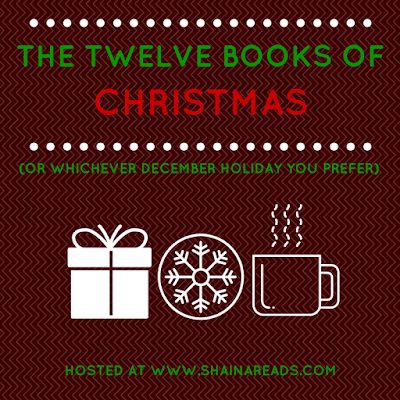 The Twelve Books of Christmas (or #12forXmas): Final Check-In! The last day of 2015 and my Twelve Books of Christmas challenge is upon us! I've returned from Oregon just in time to get this last post up and cheer you all to the finish line. As for me, I couldn't get twelve books in even if I spent the next eight hours and 39 minutes reading. A friend and her boyfriend are coming in from New York to ring in the new year with us, so it's entirely possible I already read my last page for the day. Even though I didn't reach my goal, filling December with books has been a blast, and I fully intend to keep the tradition going next year. I hope some of you will join me again! I've been working on this audio on and off since last month, and I'm settling in for the long haul. It's 27 hours long, but the narration is fabulous (so many voices!) and it's great for giving my eyes a break. Still plugging away! I think that I would lose patience reading this, but the meandering storyline is so perfect for audio. I finished this in the airport during one of several interminable flight delays, and all I could do was whine incoherently afterward (to the great amusement of my boyfriend). This is absolutely one of the best books I read all year, in no small part to the superb narration. Highly recommended. Oh, you know, your average Christmas story. I don't know that I've ever been more disgusted by a character than I was by Jack Torrance, and I enjoyed grappling with how much of that could be contributed to his own character versus the Overlook Hotel's insidious influence. Campbell Scott was a fine narrator, though I found myself yearning for It's Steven Weber. I've had this book since 2012, which might make it the oldest one on my current TBR pile. If you don't know already, I really like Montaigne. This was the perfect light biography to curl up with by the fire, though I didn't make as much progress as I'd hoped. I just started this one this morning and ate a bunch of leftover Christmas truffles in honor of the occasion. I hope I can steal away a few minutes later today to read more; it's just getting interesting! Did you finish?! Link up and/or leave me a comment so you can be entered in the raffle! I finished! I'll make a post later today.